When the celebrated Irish culinary leader and cookbook author, Darina Allen told me of a new favorite cake among the Ballymaloe Cookery School repertoire, I paid prompt attention. As she described the yellow layer cake with baked-on meringue and lemon curd filling, I couldn’t wait to open the old 1960s Culinary Arts Encyclopedia Cookbook. There it was, the Blitz Torte. I also found it in the 1950 Betty Crocker Cookbook and even as a Cream Meringue Tart in every Joy of Cooking edition I opened. Once again an old idea restages itself in different dress. The vanilla custard-filled cake is now finished with tart homemade lemon curd and whipped cream making it a light spring dessert. The name for the cake being “blitz”—or “quick”—comes from the fact that the meringue and the cake batter bake together so the icing’s already there. Once the layers have cooled the cake may be sandwiched with any number of fillings from a simple vanilla pudding to whipped cream and fresh berries. I’m going along with the lemon curd suggestion from Ireland. It’s a lovely idea for spring holiday dinners or a quick dessert for a family supper. Lemon curd can be prepared ahead and is best kept on the tart side. Grease and parchment-line 2 8-inch cake tins. Ready your stand-mixer or hand-held beater to whip egg whites. Preheat oven to 350º. Separate eggs and place egg whites in clean mixing bowl. Pour 5½ oz. sugar, cornstarch, cream of tartar and ½ teaspoon vanilla over egg whites; set aside. In separate bowl cream the butter and 3½ oz. sugar, add vanilla and egg yolks, one at a time. Continue mixing until light and creamy. Sift together flour, baking powder and salt. Blend flour into butter mixture alternately in 3 additions with the milk. Batter will be thick. Immediately begin to whip egg whites on stand mixer or as soon as possible with hand-held mixer (will take up to 5 minutes). Divide yolk batter between two prepared cake tins spreading it evenly and thinly. Work carefully here while egg whites beat to a thick, glossy meringue. 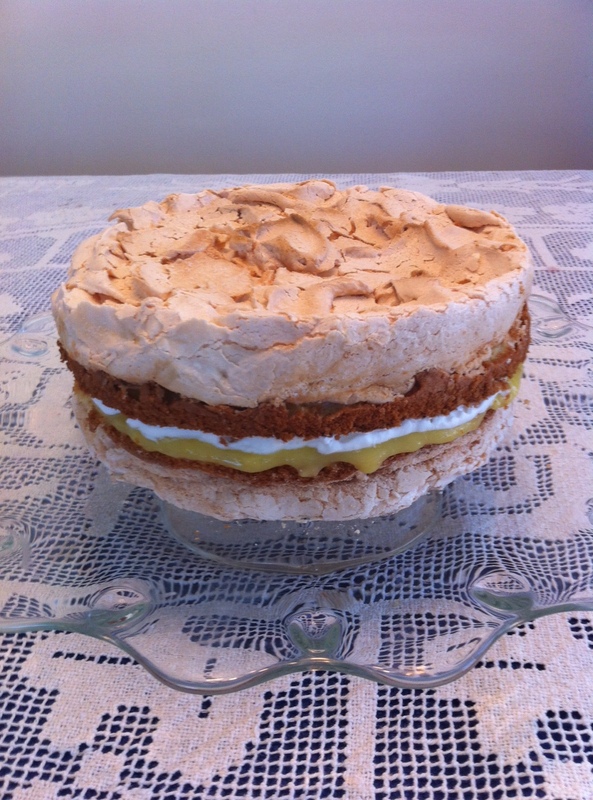 Divide meringue in dollops evenly over both cake layers. Spread one meringue to smooth surface and slightly peak second meringue layer. Place cake tins in preheated oven and bake for 30-35 minutes or until meringue is golden brown. Cool slightly then release sides of cake with flat knife. Invert on cooling rack. Remove lining paper and reverse cake layers upright onto another cooling rack. When cake is thoroughly cool, place flat meringue-topped layer, meringue side down on a serving plate. Top cake layer first with a generous spread of cool lemon curd and dollop over whipped cream, spreading the cream evenly to edge. Place second cake layer, peaked meringue side up on top of cream. Serve at once or refrigerate to serve later. Serves 8-12. It’s March and everything’s coming up cabbages. Irish eyes are smiling and corned beef’s featured in grocery stores. In Ireland the food scene is a far cry from overcooked vegetables, and it often out-French’s the French with a penchant for freshness, seasonal, artisan cooking. Even in Cork City, a dazzling vegetarian restaurant, Café Paradiso, shines as brightly as anything in San Francisco. 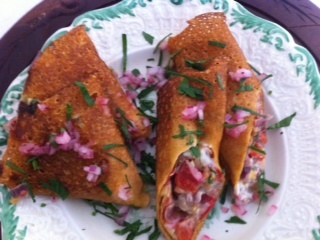 In a recent cooking class, I adapted this Paradiso recipe for cornmeal crepes, given our American supplies. It’s a great little starter or luncheon dish for winter when sweet red onions and meaty red peppers are abundant in our markets. It could be the center of a meatless meal, and it’s almost gluten free. The only step that might need some practice is roasting the red peppers. My routine is to roast peppers whenever I have a little extra space while I’m baking. For example when loaves of bread are in a 450º oven, I slide in another narrow pan with a pepper or two. After the skin puffs and blackens in about 20 minutes, turn the pepper to make sure it puffs on all sides. Once out of the oven, pop the roasted pepper into a pot with a tight-fitting lid or into a plastic bag and let it steam. When the pepper is cool, peel away the skin like a sheet of waxed paper, pull out the seed core and separate the pepper lobes. Drop the juicy roasted pepper into a jam jar, sprinkle with a little salt and refrigerate. Roasted peppers will keep for a week in the fridge. *Look for fine cornmeal in the bulk bins of Whole Foods or sift regular cornmeal to remove coarser particles that can be used for polenta. Whisk eggs in a deep bowl. Blend in cornmeal, flour, salt, cayenne, paprika and oil. Gradually beat in milk and water. Let the thin batter rest at least half an hour. Whisk and cook 2 tablespoons at a time into 10-12 lacy 7-inch pancakes. Sweat the onion in olive oil until tender. Add garlic, red pepper, chili, and cook to combine flavors. Add corn and simmer to thicken. Season with salt, add chopped parsley, cool and mix in cheese. Use to fill corn crepes either rolled into cylinders or cut in half and folded into triangles. Warm in moderate oven 10 minutes or heat in an oiled frying pan. Garnish with pickled onion and parsley. Makes a starter for 4-6 or lunch serving for 2-3. **Sprinkle chopped raw red onion with fresh lemon or lime juice, let stand 15 minutes until color brightens. Season with salt. You are currently browsing the Mary Jo's Kitchen blog archives for March, 2013.